Acute gout presents without warning. The exact cause of the disease is not known, although it is linked to a deficiency in purine metabolism. It can also be associated with minor trauma, overindulgence in purine-rich food, alcohol, surgery, fatigue, emotional and other stress. Purine is an organic compound that is common in the body and is metabolized into uric acid. Individuals suffering with gout usually have an increased concentration of uric acid in the blood, the result of increased production of uric acid and/or an impaired excretion thereof. This increased concentration of uric acid (hyperuricema) results in local deposits of monosodium urate (MSU) crystals in relatively avascular tissues (i.e. cartilage, tendons, ligaments, etc.) around the cooler distal peripheral joints . In severe long standing cases, this condition can also result in MSU crystals being deposited in larger central joints as well as also the kidneys (renal calculi). Uric acid is normally processed in the kidneys into a form of urate for excretion. Cold Laser Laser Therapy has been clinically demonstrated to shorten the duration of the initial outbreak in addition to relieving the pain associated with this stage. Following the initial attack, the patient enters a period of dormancy, known as the intercritical or symptom-free stage that may last for a long period of time. The majority of gout sufferers experience their second attack generally within 6 months to 2 years. 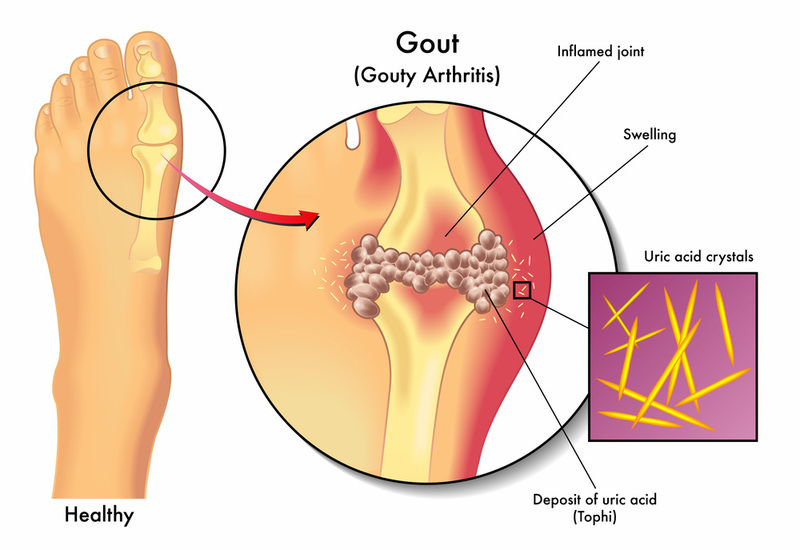 In the chronic stage of the disease, attacks of gout become more frequent and polyarticular (affecting more than one joint). Large tophi (deposits of crystals) can be found deposited in many joints during this phase. The onset of gout is generally confined to nocturnal pain in a single joint, although it can be associated with multiple joints. The pain becomes progressively more severe and at times can be excruciating. The symptoms often mimic those of acute infection with edema, elevated temperature and erythema. The soft tissues overlying the joint are usually extremely tender and in some instances even the presence of blankets touching the skin can be irritating. The overlying skin is tense, warm, shiny and red or purplish in colour. Fever, tachycardia, chills and malaise may also be present. The first treatment administered should be directed to relieve pain. Conventionally this has consisted of the use of NSAID’s and analgesics to temporarily diminish pain sensation. Cold Laser Therapy properly applied can significantly reduce the pain and swelling associated with acute outbreaks of gout immediately, with concomitant elimination of the requirement for pharmaceuticals. “both laser therapy and diclofenac (NSAID) achieved rapid pain relief in patients with acute gouty arthritis, similar in efficacy. Laser therapy was more effective than diclofenac in patients with chronic pyrophosphate arthropathy and in patients with chronic apatite deposition disease”. The majority of our patients suffering from gout on initial presentation have been on medications including Indomethacin, Colchicine, Allopurinol, etc. Most patients had continued to have persistent pain and presented in order to obtain more effective alternative therapy. Rapid resolution of pain and inflammation are infallible indicators of change in the affected joints. Whereas this approach is highly effective, patients should also be cautioned to alter their dietary habits in order to maintain low uric acid levels. Our experience indicates that Cold Laser Therapy instituted at the onset of pain is the treatment of choice in both acute and chronic gout.